I can’t stand it when a dog stares at me while I am eating. When I was growing up, none of the dogs in our house ever begged. So I am often surprised when I visit a friend who has a dog and the dog goes from person to person to beg for food. I suppose most people don’t realize that you can teach your dog not to beg. It may be hard for the dog at first, but it can be done. 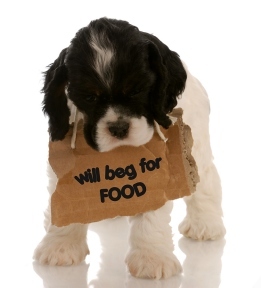 The most important thing to remember when teaching a dog not to beg is to not encourage the behavior to begin with. Never ever feed a dog from your plate while you are eating. In fact, you should completely ignore your dog during meal times. Don’t allow your family members or visitors to your home to do it either. If you must give your dog pieces of food that you don’t want, give it to them after you are done eating and when you are away from the table. Another method of keeping your dog from begging is to not give your dog the opportunity to beg. During meal times, confine your dog to their crate, outside, or in another room. This method is a good method to use when other methods are not working. If your dog can do the down-stay command, you can have them down-stay from a distance while you are eating. This is a very long down-stay so you shouldn’t try it unless your dog has mastered the down-stay command. If your dog gets up to move, tell them “No” in a very firm voice. “Eh eh” is another word you can use. Be consistent and use the word which you normally use when your dog does something they are not supposed to. After you are done eating, feel free to reward your dog with lots of treats if they have managed to down-stay during the entire meal. It is okay to still reward them even if they tried to get up a couple of times. Just as long as they are still staying after you are done eating. If it is not meal time and you are just eating a snack, tell your dog “No begging” in a very firm voice and turn around and ignore them. If your dog tries to get in position to watch you again, give the “No begging” command again and keep turning away so your dog can’t see you eat. You can also glare at them when you say “No Begging”. Keep eating and glare at them until they turn their head and eyes away. After a few moments of not looking at you while you eat, tell them “Good dog” and give them a treat. Use the glaring method only with dogs who are not going to take your glaring as a challenge. Most dogs will submit and turn away when you glare at them, but some dogs will become agitated. If your dog shows any signs of agitation, do not use this method. Signs of agitation include growling, the hairs on the back of their neck go up, they refuse to look away, and/or they hunch down in such a way that it looks like they are about to lunge at you (different than a cowering hunch). Teaching your dog not to beg has two major benefits. First, mealtimes will be much more relaxing when your dog isn’t staring at you, pawing you, or giving you sad puppy-eyes. Your friends will be amazed at your dog’s good manners. Also, by teaching your dog not to beg, you are establishing your leadership without using unnecessary force. Overall training and behavior modifications are easier when your dog sees you as the leader of the pack. This entry was posted on June 26, 2010 at 2:12 pm and is filed under Dog Training Tips. You can follow any responses to this entry through the RSS 2.0 feed. You can leave a response, or trackback from your own site. Thanks for this post! My puppy is the worst when it comes to begging for food at dinner time. It is so hard to say no to those eyes, it’s killing me! There is some great advice here, thanks for sharing. My dog is probably the worst when it come to begging for food. she follows you around. If you turn away from her, she moves so you can. She breaths heavy on your legs. My boyfriend’s dad’s dog is older and is used to getting a bit of everyone’s food. It’s to the point where he will bark at his dad (who feeds him the most) as if commanding him. I know he’s just a dog, but it drives me nuts. I was raised to only give dogs dropped food or leftovers. Sounds like your this dog really has his owner trained! I think it would really drive me nuts too. You’re right about retaining the habits of other owners. My stepdad constantly feeds his dog from his plate. The dog is so fat now and I worry for her health. But there is nothing I can tell my stepdad to convince him he’s probably doing more harm than good. This was very helpful and seems to be working, thank you!